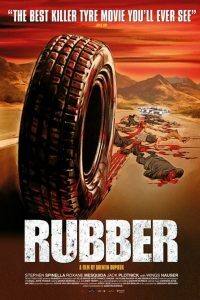 Which two words would you, and hopefully any other reasonable human being, use to describe a movie with a plot synopsis like this: an ordinary rubber tire comes to life in the middle of the Californian desert, quickly discovers that he disposes of dangerous telepathic powers and goes on a murderous stroll. The tire violently blows up people’s heads left, right and center while a cinematic audience follows his joyful escapades from a safe distance through binoculars. Well, most likely but completely justified you will use the words “absurd” and “random”. The most clever gimmick about this film, however, is that it actually points out the randomness before you even have the opportunity to ponder about it. “Rubber” opens with an extended spoken monologue by one of the characters and he repeatedly emphasizes the fact that everything in this film happens for absolutely no reason at all. Even more so, “Rubber” is an hour and a half long homage to randomness. Robert the tire comes to life for no reason. He can make small animals and human heads explode for no reason. He chases a cute brunette girl around for no reason. A group of bizarre people observe him like it’s a real life movie for no reason. You get the picture. One could claim, of course, that writer/director Quintin Dupieux’ approach is innovative, courageous and humorous. This is true, in fact, but sadly just for a very brief period. The first few images of a seemingly half-drunken tire rolling through the sand and causing cute little bunny rabbits to explode are undeniably hilarious (if you share the same twisted sense of humor, that is) but it becomes dull and derivative enormously fast. The “no reason” gimmick quickly loses its panache and general fun-factor. Okay, so there’s a psychopathic tire on a rampage and it doesn’t make any sense. We would have understand that after five exploding heads instead of fifty as well. If “Rubber” had been a short feature, it would have been equally effective. Perhaps even more. Also, and this might be a purely personal opinion, I don’t really like it when director hide themselves behind the randomness excuse. Everyone can think up a story that makes absolutely no sense. It’s too easy like that. Obviously I think there are several good things to enjoy about “Rubber” as well, otherwise I wouldn’t have given the average rating. The desolate filming locations and complementary references towards older movies are fun to spot. It was also tremendously cool to see former B-movie star Wings Hauser (“Night Shadows”, “Vice Squad”) in a prominent role again after so long. The special effects and make-up art look adorably cheesy and the electro/experimental soundtrack is quite awesome. The latter quality shouldn’t come too much as a surprise, since writer/director Quintin Dupieux is primarily known as a musician and scored a humongous hit in the late 1990’s as Mr. Oizo with “Flat Beat”.